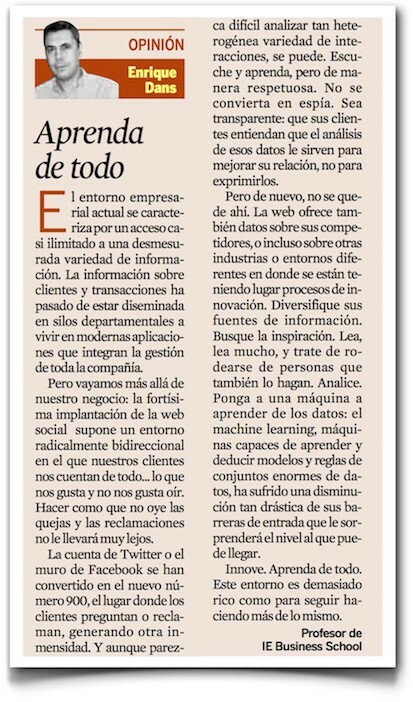 My column this week in Expansión, Spain’s leading financial daily, is called Learn from everything, and highlights the pressing need for organizational learning methodologies. Business takes place in an increasingly information-rich environment, either in terms of what we process internally or from what we receive from the exterior if we know how to listen properly. The key to competitive advantage and for developing an innovation culture in a business is in learning to listen and to analyze, based on the appropriate mentality: it’s not about hassling clients and eventually corning them with our proposals, but understanding what interests him or her, why, and how. Only when we understand the need to listen and to analyze can we start to think about the methods required to do so properly, whether through social intelligence or machine learning. The business environment we now operate in can be characterized by an almost unlimited access to a wide array of information. Information about customers and transactions is no longer filtered through departmental silos, but instead now lives within modern applications that are an integral part of a company’s management system. But beyond our business, the widespread popularity of the social networks means bi-directional communication is the order of the day, meaning that our customers want to tell us what is going on, whether we like it or not. Turning a deaf ear to complaints won’t get you very far. Twitter and Facebook are the new 900 number, the place where customers talk. It might seem impossible to analyse such a huge amount of interaction, but it can be done. Listen and learn, and respect your sources: don’t spy on them. Be open: let your customers know that analysing what they have to say will help improve your relationship, without interrogating them. But don’t just leave things there. The internet has lots of information about your competitors, as well as other industries and environments where information processes are underway. Look for inspiration. Read, read as much as possible, and try to surround yourself with people who do the same. Analyse Use machine learning: you’ll be amazed at much these devices that can detect models and rules from huge amounts of data can do, and that they are no longer as expensive as they once were. Innovate. Learn from everything. The world is too rich in information to just keep on doing the same old thing.